Timothy Less (a UK based political analyst on Eastern Europe according to LinkedIn profile in which he claims that his “primary role is running the Nova Europa political risk consultancy which helps businesses and international organisations to understand the impact of politics on their interests in Eastern Europe” ) wrote 5 January in International Policy Digest that with its new coalition government Croatia is embarking on a political experiment which, his article suggests, is destined to fail! A similarly biased analysis on governance value and immediate political flop that appointing of Tihomir Oreskovic as Prime Minister of Croatia will supposedly mean for the country was recently written by Tomislav Jakic, a journalist based in Zagreb Croatia, whose article “The Victory of Norval” not only assumes (like Timothy Less) that lack of political party alliance or belonging in a government head spells doom and gloom and inability to control the politicians in parliament, but it maliciously and wrongfully asserts that Croats living abroad and those living in Croatia are not equally Croatian. The latter platform is the hateful stand promoted by communists of former Yugoslavia and many subscribing to the left or centre-left political mood in Croatia today and it aspires to undermine the unity of all Croats – those in Croatia and those in diaspora. “…Norval has defeated Zagreb,” writes Jakic, “The diaspora has overpowered the so-called homeland Croatia. All the citizens of the Republic of Croatia who were born in it, worked in it and earned their daily bread in it honestly are offended and humiliated because a man, although born in Croatia, but had lived abroad for such a long time (mostly in Canada) that he even does not speak well his mother language, is being brought to them as their Prime Minister. And that the immediate message to all from Croatia, to all who have earned their professional knowledge in Croatian schools and universities and applied them here and in the world, is that they are incapable, that there is not a single person living in Croatia capable of being a Prime Minister…” wrote Jakic. This article by Jakic is not to be taken lightly – it is a serious attack on democracy and equal opportunity for all citizens of Croatia (no matter where they live in the world) to advance their life and professional and political circumstances as best their merit permits. It represents a loud element of a cancer that works at deteriorating the unifying fabric of all Croats in the world and as a suffocating force whose primary role is to disable and render ineffective all attempts to bring the essential reforms into Croatian economy, public administration, justice…so that it finally moves further away from the communism from which it stems. Tomislav Jakic’s said article represents the discrimination that anti-discrimination laws exist for – it is an appalling behaviour coming out of a pen of a journalist. Timothy Less and Tomislav Jakic, and all others who use “old” measures to predict the future under “new” measures, appear to disregard the important fact that since it broke away from communist Yugoslavia in pursuit of democracy 25 years ago Croatia has had elected politicians only at the helm of its governments and these politicians failed to bring about the necessary changes and reforms essential to a well-functioning, just democracy that offers equal-opportunity to all of its citizens in contributing to its prosperity. Political suitability, protectionism, political and economic and public administration and judicial corruption had lost ground somewhat during those 25 years but not enough to mark real progress. Strong reforms are required in Croatia on all fronts of public administration especially, much stronger than those that had occurred. The idea of such reforms is not popular but it is the agenda that is seeing the formation of a new government. I for one will always barrack for an opposition to a government because a parliamentary opposition has a very important role to play in the progress of public and citizen’s life but opposition based on ideological or discriminatory outbursts that are utterly unfair to a human being, not only a citizen of a country, is something that is abhorrent to me. The government formed in Croatia is likely to be the one with the main goal of achieving the needed, albeit unpopular, major reforms and as such it is not likely to be popular with everyone but one can safely say that most Croats recognise the need for major reforms. Some people may not like it but they do recognise the need for major reforms and, therefore, there is a politically impacting chance that many who do not like the major reforms announced would ultimately be convinced of the benefits of those reforms. Most/Bridge coalition says that it is adamant it wants to govern in coalition with HDZ/Croatian Democratic Union and in this to have an important input into the key government departments/ ministries, such as justice and internal affairs that are essential in achieving the needed reforms. Sweeping reforms to public administration that will likely see a rather notable reduction of government administration and departments and red tape in order to further ease economic and investment growth as well as administrative processes involved in daily living are being flagged. I think a prediction of doom and gloom is a little early. It may just be that the Prime Minister designate can hold things together ddespite being part of a huge minority in the Government. It could be that for once the MP’s will see the policy suggestions are good. It would be excellent if the PM could work well with the very forward thinking President and achieve inward investment based on Croatia’s progress. I for one have faith that Croatia can make a huge difference in Eastern Europe and prove a leader. If they continue with reforms on the minds and mouths then many a great thing can be achieved, David. It is a rather novel way of forming a government of Croatia but as long as things focus on the tasks of reforms rather than political agenda much will be achieved. There are good signs of great success there and I am happy about that. I second that David. I have big hopes for Croatia. I hope the reforms will come soon and help fulfil this huge potential. The announcement of a couple of days ago that the new government partnership is contemplating a new ministry for families and emigration sound really good for families and emigration were and are affected together by members emigrating out in past under communism and these days. I applaud that. Noticed that, Wilkinson – I think it a great idea also. I am not in total agreement with this assessment. First off you can see that it came out of the UK which I have little to no respect for it’s country or people and deem anything that comes out of there as suspect. In all politics there will always be groups who will attempt to undermine the others for their own gain.My goal has always been to see Milanovic gone completely and it seems that just maybe that will occur. I also would like to see Karamarko gone as well even though I have been a supporter of his in the past. While I am grateful that he has so far to this day put his ego aside I still feel that he has let us down by not working hard enough to win out right this election and for that I can not continue to support his efforts 100%.I felt that there was an air of arrogance of there is no one else but us to elect and his focus was more on him then the party. In fact I think that if he truly loves Croatia more then politics he should step aside and allow MOST to control the ministries that they are asking for. This would be a good start to cleaning a corrupt system and can not get any worse then it is. This is not to say that MOST has won me over 100% either. I liked very much a majority of their platform and think that if they are able to get half of it implemented it would be good for Croatia . I believe that according to their platform and insistence on the ministry of interior and forming a new ministry on emigre that it would be more inclined to support a faster path of generational citizenship for the children of the diaspora which is in the best interest of the economy and national security more importantly so that we do not ever lose our culture, ethnicity, and religious values. I also believe that MOST understands that our national security with regards to immigration other then Croats is key to our survival and an issue that should not be played with like what SDP has done. It is way to risky at this stage in our history to even give an inch. As to our new PM I do not believe that he will be a total failure or manipulated by either parties. He does not strike me as someone who came into office because of his politics but more so for the love of our country.If he focuses on the economy and stopping the exit of our young he will have done a lot for our country because no of the other parties were able to do so. I believe that the path of standing down while the parties negotiate is admirable because he is removing himself from the parties politics and will be able to listen to both sides before giving his input and making decisions. I also believe that this is very good regardless of the out come because it gives all parties a new way of thinking. We are all Croats and somehow the article is saying that the diaspora is not part of the real Croat. This is an attempt to further divide our country and will fail. We all want the best for our people and country and this is another attempt by the SDP communist sympathizers to spread false propaganda.Everyone knows that the diaspora carries a lot of political weight when push comes to shove. I also find it appalling that one would attempt to write an article that would attempt to denigrate the PM to the role of a mouse that will be stepped on by the giants in the room. The same was said and attempted about our american educated president and that too failed. I personally think that with the mix of experience that we have now that a lot of good can come from it. It is in the best interest of the HDZ to work together for the better of the country then the party. If this is done and the results are positive it will strengthen the party and perhaps next round we should be able to win the election solidly. We are in agreement, Michael – I too do not agree with the assessment coming out of UK, leaving the author’s conflict of interests aside as it looks like writing such assessments may also be a way to drum up business for firm he works and politically steer it away from Croatia as many many political and otherwise forces from UK did quite a lot to try and thwart the breakup of communist Yugoslavia with Serb leaders installed in important places. All that aside I cannot see much value in the use of political tool in assessing something that has much more than politics in it like strong will for practical changes and reforms. Of course reforms can be a political tool but this time the master-handler (prime minister) is not a member of any party…so factors driving success (and failure, God forbid) are different than in a classical political party majority government. Of course, every political party should strive to win majority and it would be natural that all not just HDZ strive to win it next time around, hence the question of HDZ leadership you speak of I seek to answer more widely than you: e.g. 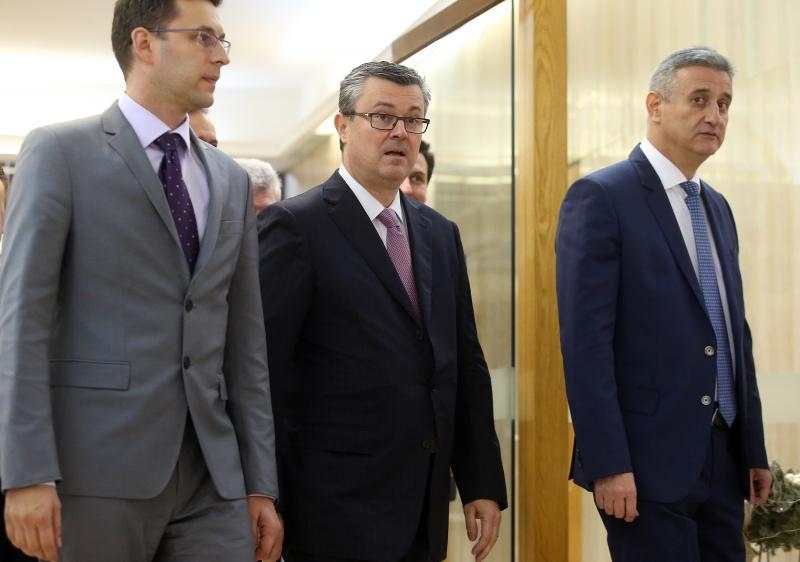 either Karamarko goes or Secretary Brkic goes or both go – the two at the helm have not done much to better HDZs chances in reality of winning back the trust of wider population of voters. Furthermore some of the personalities who have been there since the party’s beginning should also be replaced with new blood and the old ones used to plump up the new energy with experience from background. As to the idea for family and emigration ministry I think it’s brilliant because family is central to the society’s health. Ina, my first thoughts upon reading these commentaries are: who the hell are they? I find it terribly disturbing that people who have little knowledge or basis for outlandish claims seem to hold nothing but contempt for anything remotely resembling fiscally prudent, patriotic, centre-right politics. Amazing how they predict dire consequences for Croatia under this new government but do nothing but praise the old apparatchiks like Josipovic and his communist ilk. Terribly disturbing and regardless of where they are writing from speaks of a yellow journalism that falls over itself to keep the socialists/communists in power. We saw this in the early 1990s when members of the international press corps, not only subtly but overtly supported the JNA and it’s attacks on Croatia, calling Croatian defenders fascists. They went out of their way to attack President Tudjman and Croatia’s defensive war. When Croatia’s new president, Kolinda Grabar-Kitarovic was first elected I read foreign press reports that painted her to be some kind of a right-wing hater. Utter garbage based on absolutely nothing. But sadly most journos tend to lean way left and will trounce on Croatia and any changes for the better. I continue to grow in my knowledge of your country Ina. This is thanks to your blog. I read a lot of the comments and what attracts me to read is the passion I find in you to shape thought positively in and out about Croatia. I see your blog growing more and more into a powerful force both at home and abroad and I encourage your efforts. I like to see someone doing something positive with passion. It leads to success in a big way. THE UNDERCUTTERS AND HEAD BUTTERS WILL BITE YOU…BUT THEY CAN BE WORKED AROUND! Let us hope that those who use those ‘Old Measures’ come into the New Paradigm of thinking.. Because those ‘Old Messures’ have been proven they are no longer working..